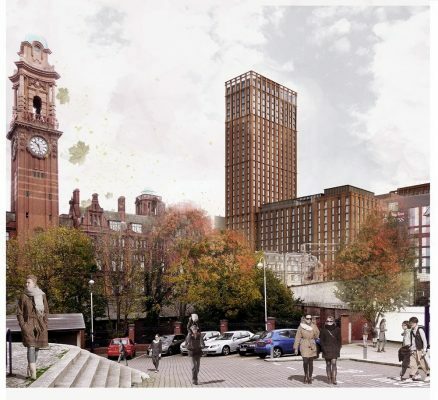 The vision for Oxford Road’s new neighbourhood, Circle Square, is one step closer to realisation today after joint venture partners Select Property Group (Select) and Bruntwood were given planning permission for the biggest planning application of the scheme. 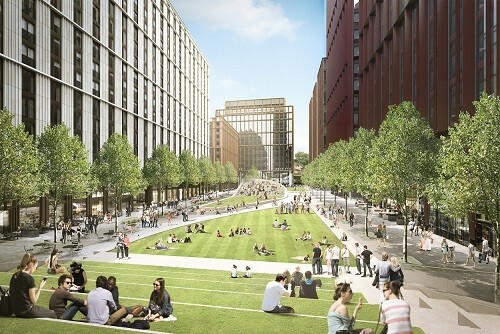 With 60% of the scheme set to complete by the end of 2019, Circle Square will stand in the place of the former BBC site at the heart of Corridor Manchester and be an inspiring new destination where like-minded people will live, work and collaborate. 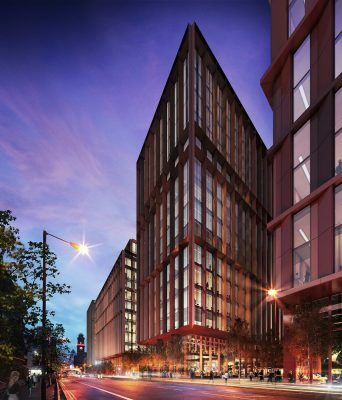 Set to reshape Manchester’s cultural and business scene, Circle Square’s phase 1b permission includes 105,000 sqft of shops, cafés, bars and restaurants, 305,630 sqft of work space, 677 residential apartments and 1,000 space multi-storey car park, as well as much needed green space and public realm. Central to the neighbourhood will be two collaborative leisure spaces that enable people and businesses to come together. The Green will be a much needed outdoor space for the city, with a 20,000 sq ft pavilion underneath, offering a wide variety of indoor and outdoor events and restaurants. The surrounding public realm, called The Ribbon, will be brought to life with a diverse mix of shops, cafés, bars and restaurants. Closer to the river will be a green street called Medlock Place, smaller in scale and full of character, with trees and shrubs running the length of it, independent shops and an urban high street vibe side by side with innovative rain gardens and relaxing outdoor seating for people to get together. Facing The Green, two build-to-rent apartment buildings will be delivered and managed under Select’s Affinity Living brand. Designed for a social generation who want to live in city centre locations with access to communal facilities, it will feature a range of indoor and outdoor spaces that can be used by both residents and the general public. The Oxford Road gateway, architecturally inspired by the grand Victorian warehouses of the area, will act as the main entrance to Circle Square and will comprise two new Grade A office buildings of flexible workspaces where progressive businesses will collaborate to drive innovation and to compete. Phase 1A of Circle Square, approved in January 2016, is already well underway, with Select’s award winning Vita Student accommodation currently in construction alongside tranquil riverside walks and gardens. The phase is due to be completed in September 2017. Construction of Phase 1B will start early 2017. 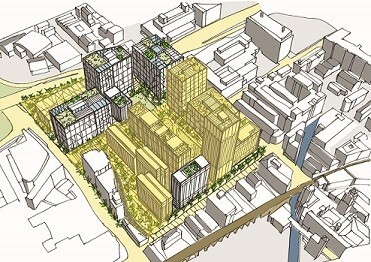 The Masterplanning & Placemaking consultants for Circle Square are Planit and Feilden Clegg Bradley Studios. The architect for the scheme is also Feilden Clegg Bradley Studios.